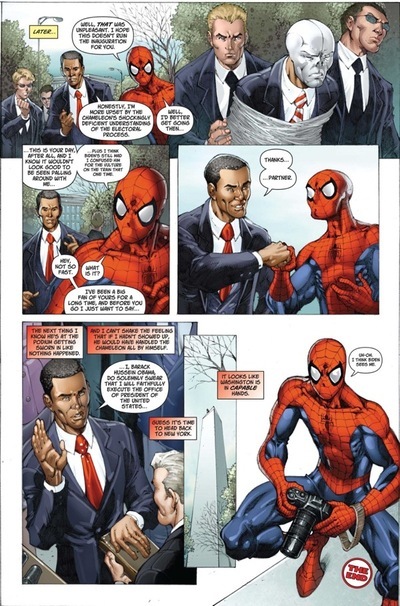 In order to commemorate the inauguration of Barack Obama, President-elect and admitted Spider-Man collector, as 44th President of the United States, Marvel Comics just had to have Spider-Man meet the new President. 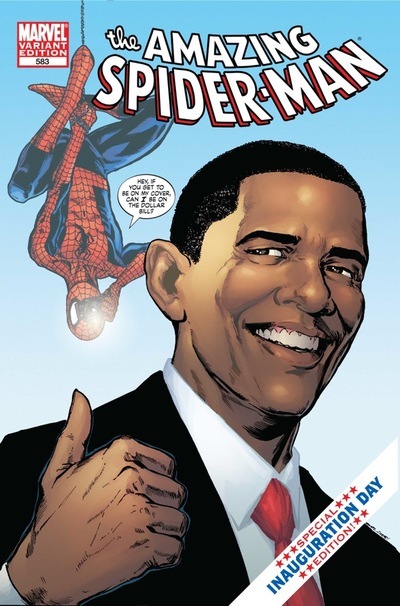 "When we heard that President-Elect Obama is a collector of Spider-Man comics, we knew that these two historic figures had to meet in our comics' Marvel Universe," says Marvel's Editor-in-Chief Joe Quesada. 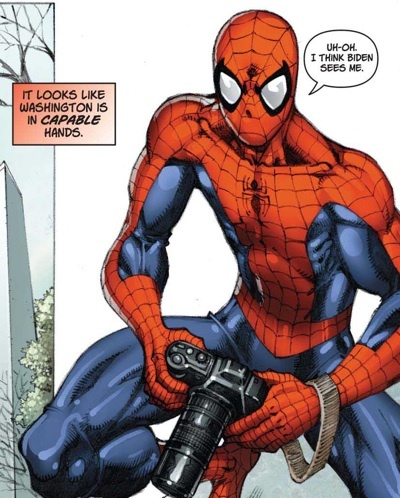 "Historic moments such as this one can be reflected in our comics because the Marvel Universe is set in the real world. A Spider-Man fan moving into the Oval Office is an event that must be commemorated in the pages of Amazing Spider-Man." The story is a quick read, full of laughs (sometimes at the expense of an absent Joe Biden) and details a plot by a super-villain to disrupt the inauguration. Fortunately, Peter Parker is covering the event as a photographer, which means Spider-Man is close at hand to deal with the problem. This six page back up is written by Zeb Wells, drawn by Todd Nauck and appears in Amazing Spider-Man #583 which hits stands and finer comic book shops everywhere on January 14th, just in time for the inauguration. Bryan Young is the producer of Killer at Large and writes about comics at Big Shiny Robot!